Happy Sunday! Boy the weekend sure did fly by. Mothers day is exactly one week away. Have you decided on what you will be doing for mom? As a Walmart Mom I was asked to share my thoughts on what I would want for a Mothers Day Breakfast or Brunch? Well that was an easy answer. What I would want is not to be the one to do any of the cooking. In order for that to be possible in my house the Mothers Day Menu needs to be easy. The kids and I planned out a simple breakfast menu and then picked up everything we needed at our local Walmart. 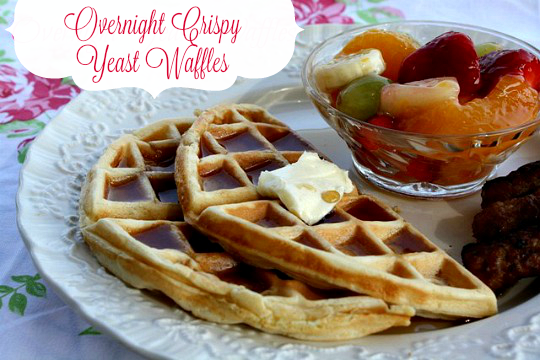 I love homemade waffles, so the recipe I chose was for my favorite Overnight Yeast Waffles. This recipe is really simple because the batter is prepared the night before. By making the batter ahead of time that will leave less work to be done in the morning.I did help the kids prepare the batter, but only to heat the water and milk up. They did the measuring and mixing all by themselves. If you have little ones dad will need to step in and help out a bit. The kids requested their favorite Easy Fruit Salad and some maple brown and serve sausage links to go with the waffles. The fruit salad is also another easy recipe that the kids can tackle all by themselves. Again if you have little ones dad will need to help with the can opener and slicing up the bananas and strawberries. The kids can pretty much do everything else. Mackenzie handles a knife really well so she sliced the strawberries and bananas. Other than that this fruit salad is easy to throw together. Just toss everything in a bowl, gently mix and chill until ready to serve. Click here to get the recipe for this Easy Fruit Salad recipe. Here's my daughter frying up the sausage links and cooking the waffles (Dad helped her set up the waffle iron). I feel so blessed to have children that share the same love of cooking as I do ♥. All of my kids are such great helpers in the kitchen. Serve this beautiful meal to mom on a tray for breakfast in bed or eat together as a family like we did. Either way I know she will love it. Mackenzie even picked some fresh roses and we placed them in a small glass milk bottle. I hope you enjoyed a few of my easy breakfast ideas. Combine flour, yeast, sugar and salt in mixing bowl. Combine milk, water, and oil; heat to 120° to 130°F. Add liquid ingredients to dry mixture; add the vanilla extract; blend on low speed. Add eggs. Beat 2 to 3 minutes on medium speed. Cover bowl; refrigerate batter several hours or overnight. When ready to serve, stir down batter. Bake on waffle iron using medium/high heat. Serve hot with butter and syrup, or your favorite toppings. I'm part of the Walmart Moms Program. Walmart has provided me with a gift card and compensation for my time and efforts in creating this post. Participation in this program is voluntary and the opinions stated above are entirely my own. I've never heard of this type of waffles! I love the idea of being able to make the batter at night and then you are ready to go in the morning. Que rico postre saludable y vitamínico,compré la máquina de waffle haré su postre,abrazos hugs,hugs. Great recipes! My kids love fruit salads too. We use all the same fruits that are in yours except we dont add the pie filling. We add 1-2 tsp vanilla extract and 1/4 cup of powdered sugar. Mix and chill. They love it! Will have to try the pie filling version next. I have a strange question, I only have a belgium waffle maker, would this work or do I need a regular one??!! I would love to make these with my kids this weekend.